Surrounding the Exhibit Center is the Arboretum which was established to showcase plants that have a direct link to those that existed during the Age of Dinosaurs. Some plantings include unusual species while others contain familiar trees and shrubs. Because of the arboretum's importance, the FDPA changed its name in the early 1990s to include Arboretum, recognizing its value as an educational resource. 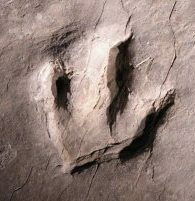 When dinosaurs first became numerous in the late Triassic Period, nearly all of the major groups of vascular plants except the angiosperms were in existence. 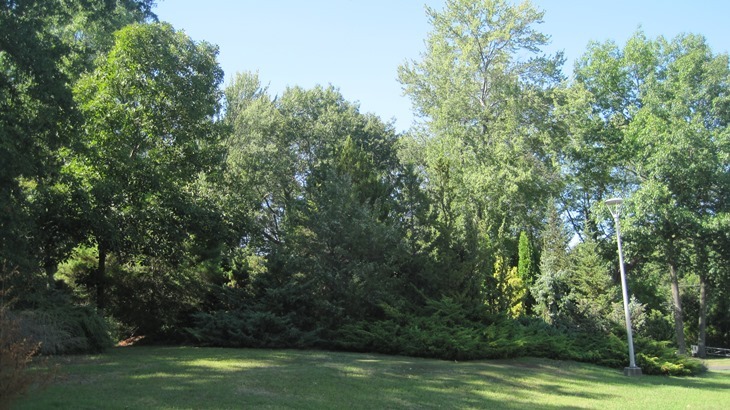 Conifers, cycadophytes, ginkgoes, ferns and large arborescent horsetails dominated the landscape. By the mid-Jurassic Period, conifers had become more diverse and many of their fossils have been assigned to modern families such as Araucariaceae, Pinaceae and Taxodiaceae. Angiosperm pollen and leaves first appeared in the fossil record about 140 million years ago in the early Cretaceous Period. By about 90 million years ago, several modern families of flowering plants are represented by good fossil material. These families include the Lauraceae (laurel), Magnoliaceae (magnolia), Platanaceae (sycamore), Buxaceae (box) and Calycantheaceae (sweet shrub). By the end of the Cretaceous Period, many modern plant families existed with the last dinosaurs. Our goal is to grow representatives of as many of the Mesozoic Era plants families as we can within our zone 6 site. The initial plantings established a "backbone" of hardy conifers and then the collection was filled out with dwarf and slow-growing conifer cultivars. Currently, there are more than 200 different kinds of conifers in the collection. Recent plantings have focused on trees and shrubs from the Cretaceous angiosperm families. The largest gera collections are pine, juniper, charmaecyparis, arborvitae and magnolia. The "Arboretum of Evolution" which began to take form more than 30 years ago is very young, but has grown into an important asset for the Park and for educators. 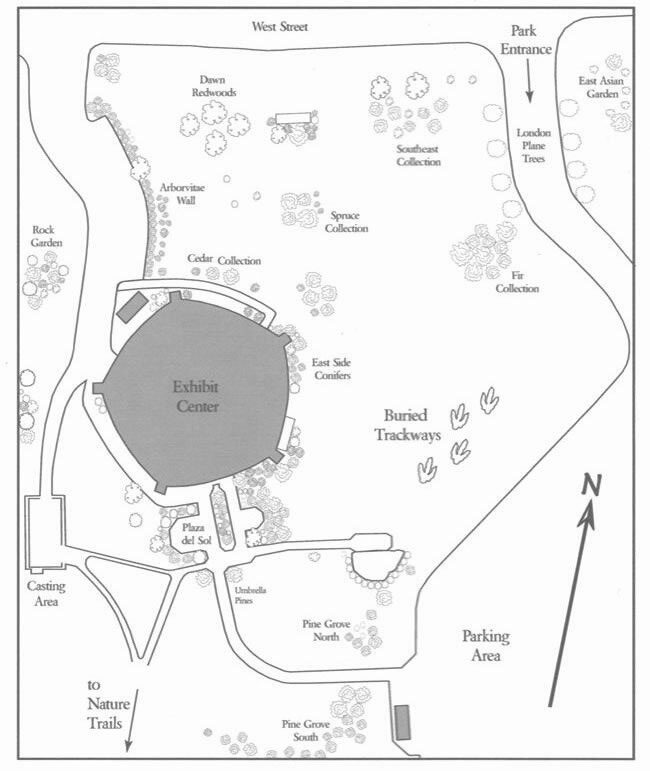 Content of collections and gardens identified on the map are listed under Plantings. Fir Collection - Within this area of the park there are Douglas firs, Nikko Fir, Nordmann firs and concolor firs. Arborvitae Wall- The name of these conifers means “tree of life” because some of these conifers can live up to 300 years. Among other plants that form the wall is the Hiba arborvitae (Thujopsis dolabrata ‘Variagata”). Cedar Collection- Within this collection are the Lebanon cedar, Deodar Cedars, Blue Atlas Cedars and the California incensecedar. Pine Grove- “White Mountain’ white pine, Blue Jay, Himalayan pine, Bosnian pine, ‘Pendula’ white pine and a ‘Waterii’ Scots pine grow within this grove near the entrance sidewalk. Rock Garden- Among the exposed ledges are plantings of junipers, false cypresses, small arborvitae, dwarf firs and flowering plants such as lavender and thyme. Plaza del Sol- Near the entrance to the Exhibit Center are Japanese umbrella pines, recognizable by their plastic-looking foliage. Southeast Collection- Plantings in this location include the bald cypress, American sycamores, black gum, willow oak, pawpaws, sweetbay magnolia, Carolina allspice and a persimmon. Close by is a giant sequoia (Sequoiadendron giganteum) which can grow to 300 feet in its native habitat in California and a “Hazel Smith” cultivar. Four Dawn Redwoods and a golden larch are also located in this area. Spruce Collection- Within this area are Hondo spruce, Oriental spruce, Serbian spruce and a Black Hills spruce. East Asian Garden The rare and unusual species in this planting include the Chinese swamp cypress, a weeping katsura tree, a “kew” ginkgo and a thicket of yellow-grove bamboo. London Plane Trees- Lining the entrance drive are hybrids of American and Eurasian sycamores.